Is the endpoint backup of your mobile workforce being challenged? Learn how Connected MX addresses these challenges with optimized, continuous data protection. 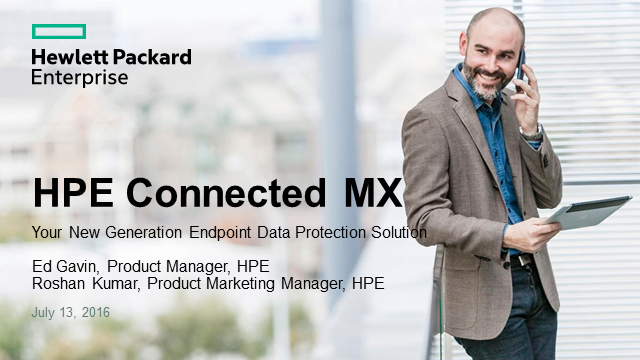 Understand how Connected MX safeguards your organization's endpoint data with enterprise-grade security features. Here the success Connected MX is already having on organizations who have transitioned from Connected Backup to Connected MX, and how you can also benefit from this. What value does automation and big data analytics bring? Big Data analytics provides actionable insight and fast knowledge delivery. It allows you to see trends in incident and other service desk data for an easy jumpstart into proactive problem management. Together with faster call handling and problem resolution times, there are significant improvements in efficiency and a decrease in cost for the IT organization. -Thore Senneset – Incident Manager in HEMIT, Norway – on how Smart Analytics helped them reduce incident and interaction resolution times. -Markus Hammelmann – Dipl.-Ing., MBA working for T-Systems GmbH, Germany – will share how Smart Email helps T-Systems to automatically classify incoming tickets and help them to reduce email ticket handling time. Linus Linder, IT Director at FARO Europe GmbH & Co. KG. Measurement technology specialist, FARO, needed to advance its IT Service Management (ITSM) to ensure ongoing support for 1,500 employees worldwide and to safeguard efficient operation of its new SAP deployment. Delivered from the cloud, HPE Service Anywhere was the solution. Join Linus Linder, Director IT at FARO Europe GmbH & Co. KG, as he shares his experiences on his journey to zero incidents. In this 2nd short video (3 mins) Tim Grieveson, EMEA Chief Cyber & Security Strategist, Hewlett Packard Enterprise discusses the findings of the 6th Annual Cost of Cyber Crime report, conducted by the Ponemon Institute. Breaches are more expensive and are taking longer to remediate. It’s not if, it’s when will my organization be breached. Watch this short video (3 mins) as Tim Grieveson, EMEA Chief Cyber & Security Strategist, Hewlett Packard Enterprise discusses the findings of the 6th Annual Cost of Cyber Crime report, conducted by the Ponemon Institute. Tim looks at the top trends highlighted in the report and identifies what you need to know to create business value from security intelligence. Charl Joubert from University of Pretoria in South Africa explains why HP Service Manager with Smart Analytics leverages Big Data to be a game changer for problem management at the service desk and how amazing gains have been measured on daily tasks. COMLINE has updated and improved its datacenter to the next generation, based on HP Cloud Service Automation and HP Operation Orchestration. COMLINE has built a secure and highly automated hybrid cloud architecture to deliver IT services to SMEs throughout Germany from an advanced data centre. Return on investment has been achieved in less than one year along with 80% company productivity gain. Nalin Parbhu, Chief Executive Officer, Infuse Consulting Ltd.
UK-based global IT services company Infuse uses HP Service Anywhere to manage its own internal IT services as well as being a key part of its innovative useMango™ solution. useMango™ saves customers 40% on testing costs and 80% of time savings. Join Infuse CEO Nalin Parbhu for this interactive session where he will share how HP Service Anywhere keeps Infuse and useMango™ ahead of the game – and how it can do the same for you. Join this webinar to hear what challenges Faro were facing around IT Service Management and why they chose HP Service Anywhere; which is an intuitive self-service portal - providing effective and easy problem management and much more. FARO is the leading and trusted source for 3D measurement, imaging and realization technology. The company develops and markets computer-aided measurement and imaging devices and software. Worldwide, approximately 15,000 customers are operating over 30,000 installations of FARO systems. Everything is digital. Industries are transformed as products and services become “software-defined”. Organizations win by putting engaging applications in the hands of customers and insightful data in the hands of employees. This new style of business requires a new style of IT. Core IT to deliver the backbone of services to run business operations, and Fluid IT to be a partner in building brands, experiences, and loyalty. IT faces a challenge – how to be efficient and consistent, as well as experimental and innovative. emerged is a bimodal IT paradigm, where both traditional Core IT and modern Fluid IT are essential to the IT environment of a successful modern business. A traditional IT system offers slower development but stable compute and solid security. Fluid IT is a reaction to the demands of the modern world—it is all about speed and agility as concepts are taken to market with ever-increasing speed, starting with minimal viable products. But this is not a case of old versus new, or good versus bad; successful businesses are those that learn to implement both. Imagine a single, enterprise-level platform for all performance testing. Globally distributed engineers sharing a common testing infrastructure. All licenses consolidated into a single, easily accessible pool. Simple, single-instance installation and upgrade. Imagine no more. Join this webinar to see the new innovations in Performance Testing from HP. Discover how HP Agile Manager can empower your teams, provide unparalleled visibility and allow you to achieve nimbleness in the face of complexity and change. HP Solutions for Agile Delivery enable you to move from being a development practice to being a delivery practice by integrating key disciplines like requirements and QA. They make your application teams more responsive. And they result in higher quality and lower-risk deliveries. With HP Network Virtualization solutions you can simulate and test real-world network conditions to improve application accuracy, reliability and performance. Enabling you to quickly discover and capture network conditions from hundreds of millions of true last-mile end points. In this live demo you’ll discover how to network-enable your functional and non-functional tests to identify user issues before deployment, test actual capacity and optimize mobile, web and other applications. IT organizations are tasked with delivering end-to-end services for infrastructure and applications, while concurrent revolutions in cloud computing, mobility, big data and security are redefining what enterprise users expect from their applications and IT services. IT professionals need to manage the complexity of accelerated delivery of services across traditional IT Data Centers or cloud environments—whether it is a full stack of infrastructure from storage, network, servers to databases or right up to the application layer. As an IT organization, success depends on efficiently orchestrating operations across functional silos, eliminating the hand-offs, delays and errors that lower the end users’ experiences. So join Andy Mackay and Muneer Mubashir as they discuss what the Orchestrated Data Center really is. What value does your IT Service Management solution provide to your business? To your users? How do you measure service quality and efficiency? In a world where IT performance data is spread across many systems, using spreadsheets or other manual tools is error-prone and inefficient. On the other hand the data to answer these questions is there – it’s in your service desk and other solutions. What if you could access this operational performance data coming from different systems and tools through a single lens and get meaningful answers from it? Join this session to learn more about IT performance KPIs and how we can help you demonstrate value to your business and IT users. The IT world is changing rapidly, but latest mega trends like cloud and mobility do not change the set of challenges and drivers IT organizations are constantly facing: cost, quality and compliance – even more so with the fast shift of traditional first-level tasks to more self-services. Automation can help tackle these. But what does automation really mean? What should be automated? How would you automate? And what are the benefits you can expect? Join this session to discuss the process – integration – automation triangle and then learn about examples like change management and request-to-fulfill to discuss some starting points for a pragmatic approach for automating ITSM. Your enterprise depends on actionable insight being securely delivered to the right person, at the right time, to influence what they do or the decisions they make. To stay ahead of the competition, become more profitable, and improve your operations, increasingly requires a real-time fusion and analysis of large volumes of structured machine (sensors, embedded software, etc. ), unstructured-human (social media, documents, audio, video, etc. ), and traditional transactional data. Join this webinar to hear HP's strategy to harness the power of Big Data, including HP's latest innovations with HAVEn (Hadoop, Autonomy, Vertica, Enterprise Security, and n-apps), the industry's first comprehensive, scalable, open, and secure platform for Big Data. Hear stories of innovative companies already putting these ideas into practice. IT organizations are currently spending 65-80% of their budget on maintenance. But traditional application management services are falling short, leaving IT stuck in reactive mode with unpredictable costs, gaps between internal and external providers, and challenges in innovation. HP Solution Management Services (SMS) provides a holistic approach with a single point of accountability to help you control cost, improve quality and realize the value of your enterprise HP Software solution. Today’s IT environment is full of new technology, trends, vendor proprietary solutions, virtualization strategies, BIG DATA, Enterpise applications and much more. Although there have been great advances with innovation and performance, the current scene is a setting for complexity that comes with various interfaces as well as de-centralized management of daily trends or key performance indicators. A well-managed storage environment is constantly evolving, and managing storage resources effectively has become increasingly complicated. The transition to virtualized machines, software-defined storage, and cloud computing has created greater dynamics and has made managing a global infrastructure even more difficult. In this session, you will hear about increasing asset visibility and managing a global heterogeneous storage infrastructure. We will cover topics including capacity and utilization planning, application to spindle performance, as well as centralized storage resource management and reporting. You will get practical advice that you can use to determine the value of a storage resource management solution. Simplify the complex needs of your business by taking a holistic approach to IT software. With our complete portfolio of products, HPE can help optimize your applications, information and infrastructure – with security and confidence. Aimed at IT Operations and Applications managers as well as Developers who need to get a greater understanding of how the HPE IT Performance suite can benefit their organization.